Robbie McEwen is an Australian guy who is one of the world’s best (if not the best) cyclists – Robbie is an incredible sprinter and has won just about everything you dream of winning as a cyclist. He’s back home in Australia at the moment and has just raced (yesterday), and won, the Waeco Darren Smith Cycle Classic was run at the Peppers Salt Resort at Kingscliff, about 30km from where I live. Darren was a highly talented cyclist who was tragically killed on a training ride here on the Gold Coast in 1994. Robbie was a good mate of Darren’s and has often spoken of his desire to be his best in memory of his mate. I wandered down to take a look at the race, with my 2 sons – Jack and Harry – in tow. Jack in particular loves his cycling and Robbie McEwen is his favourite cyclist by a mile. He found it amazing that we were watching Robbie in the Tour De France a few weeks back and here was Robbie standing just a few metres away. Being ultra-cool 13 and 15 yo boys they couldn’t possibly do that (! ), but no such embarrassment for their old man. I went up and introduced myself to Robbie and had a quick chat and motioned the boys to come over and meet him. Jack came over and met Robbie, but Harry was too embarrassed/shy/dopey. Robbie was more than happy to pose for a photo with Jack and have a quick word. 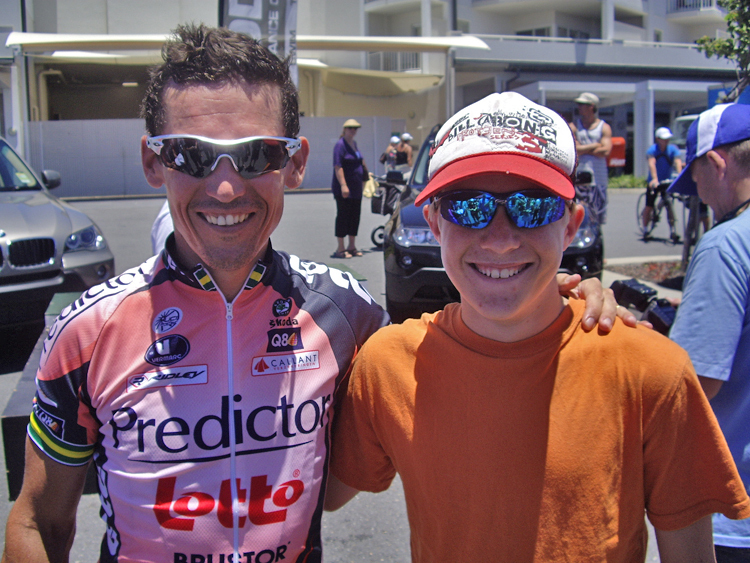 Jack is absolutely thrilled he has a photo with Robbie McEwen. That photo is now Jack’s screensaver. He wants to get the photo printed and framed for his wall. Robbie McEwen now has 3 fans for life. Robbie McEwen has helped raise the profile of bike riding in the local area by doing this race and using his profile to help promote the race. 1 kid (Harry) is now far more likely to start bike riding. If I can draw a bit of a bow, I’ll compare what Robbie has done to what you might do in business. What Robbie has done here is provide great value. It’s what you must do in business each and every day. finishing off with some encouragement for a ride Jack will be doing next year. Now, as you can see by the photo Robbie is a pro at this stuff. He’s not standing there with his hands by his sides, without a smile waiting for the photo to be taken. What’s he’s done is seize an opportunity and provided a ton of value to Jack (and I). Take a look. He’s put his arm across Jack’s shoulder in a comfortable and friendly way that, when Jack looks at it, has Jack thinking, “It looks like Robbie’s happy to be there, it doesn’t look like I’m imposing on Robbie” – and that’s absolutely critical for a 15 yo shy kid to be thinking. As a high profile superstar in cycling Robbie must get these sort of photos requests thousands and thousands of times. It would become, I’d imagine, boring and repetitive. Nope. I don’t think so. That’s the thing about value – when you provide great value in a positive way, you usually get a ton of value back. P.S: I’ll be willing to bet that next time Jack gets a jersey he’ll ask for a Predictor Lotto one! P.P.S: Robbie’s young son was there on Sunday – the little fella has the coolest name ever: Ewen McEwen.